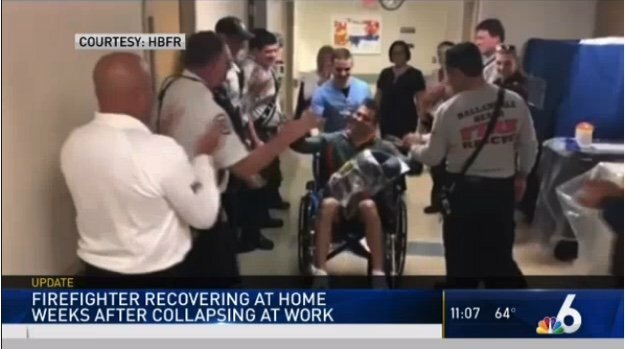 A Hallandale Beach firefighter paramedic who suddenly collapsed at work from a heart condition is now recovering at home after spending weeks at a hospital. Hallandale Beach Fire Rescue shared a video on Twitter Tuesday night of Erik “The Hulk” Conde leaving the hospital surrounded by cheering co-workers. Conde was nearing the end of his shift at Hallandale Beach Fire Rescue last month when he suddenly collapsed onto the floor of the station, his heart not pumping and his body not breathing. His crew was able to get his heart re-started and he was rushed to the Cardiac Intensive Care Unit at Aventura Medical Center. “The diagnosis is that Erik’s lungs were somehow injured, probably from an infection he’d been harboring as many of the patients we come in contact with are fighting an illness of one kind or another,” fire rescue officials said in a statement.